A few weeks ago, I hit one million page views over the lifetime of this blog! 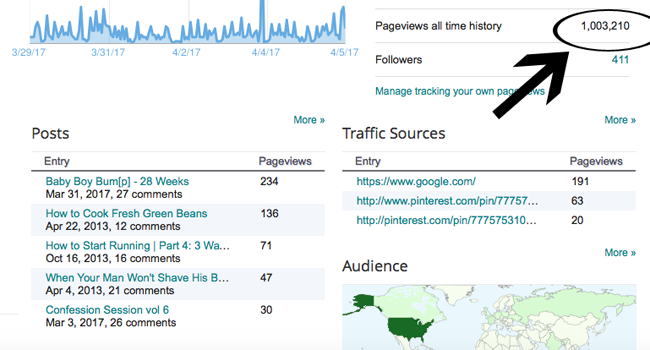 I realize some bloggers get that many page views a month (or a week probably! ), but I still think that's a significant number considering the size of this old blog here. In case you haven't been around since the beginning (so.... basically if you aren't either Jordan or my mother), I started blogging in May 2010 as a creative expression of my writing when I was at a job where I edited other people's writing all day long. Seven years later, I am still blogging and still editing and still enjoying having this blog as an outlet to share my own writing. I have never had a specific niche or a set schedule but have always just blogged about what I wanted to, when I wanted to. I remember when I had 10 followers and thought about what it would be like to have 100. I still don't have too many more followers after all this time, but I love the ones I've got and am not in it for money or fame, although I have to admit that sometimes I think both of those would be nice! It's difficult to measure the success of a blog, because everyone is going to see success in such a different way. If success were measured only by page views and comments and followers, I probably fail. The things that mean the most to me is when I get a comment or an email from someone telling me that what I wrote resonated with them. I hope to be an encouragement in any of the various topics I talk about on this blog, and I honestly also really hope to be a light for Jesus. I have never felt called to blog specifically and exclusively about my faith, but I do feel that God has given me a (small) platform, and I want to be a good steward of that. I know that not everyone who comes to this blog is going to share my beliefs, and that's completely fine. I want you to feel welcome here and maybe find something you can relate to or be encouraged by! Since it's coming up on this blog's seventh birthday, and since I recently hit one million page views, I thought I would take a trip into the archives of The Lady Okie Blog and share a few favorites. I honestly have so many posts that I love, and looking back, there are a lot I am proud of. These are not by any means the only good ones, but as I went back through my list of archives, these stood out for one reason or another as ones I wanted to highlight from the past seven years. *You can also browse by topic using the top navigation bar, and all of my posts are "tagged" to various topics, so you can always click on those to see other posts with that same label. For example, this post is tagged "blogging," and clicking on that word will bring up any post that I've tagged "blogging." My Bucket List and a Half Marathon - Officially signing up for my first half marathon was a Big Deal, and I remember crying while writing this recap. It wasn't my fastest time, but it's one I will remember forever. 10 Reasons Running a Marathon is Like Having a Baby - I wrote this two years before actually having a baby myself, and it's actually quite accurate (in my opinion). A Bean, a Bench, and a Bride: Our Engagement Story - I love that I have the story of our engagement written down in such detail! I wrote this in 2010, so it's one of my oldest posts and a lovely memory to look back on. We Still Do - I was nervous to share this rather vulnerable post, but it is one of my most well-received posts as far as emails I got from people responding to this topic. Marriage is hard, and after watching two sets of friends go through a divorce over the past year, I feel more than ever that self-evaluation of marriage is a good and important thing to do every so often. My Grandpa's Tie - I am just so glad I wrote this down because it's so weird and random that you wouldn't believe it if there weren't proof. This is one of my older posts, written in 2012. Do You Sell Hot Apple Cider? - My family talks about this every Christmas. This is one of those "remember that time when...?" Then the Cops Showed Up - This is a funny story now. Not so much at the time. The Tale of the Unmatched Office Prank - The first and only time I've ever been truly pranked, and it was amazing. How I Feel About Target - I wrote this in July 2013, and I could have written it yesterday! Seriously it's still so true. How to Cook Fresh Green Beans - Written in April 2013, this is by far this blog's most popular post. It has thousands of pins and tens of thousands of page views. I have no idea why it's so popular, but there you have it. My Top 10 Books of All Time - I narrowed down my favorite books of all time to a list of ten. Ten! That's craziness. I wrote this in 2014, so I might need to reevaluate and see if any in the last couple of years needs to be added in, but these ten are still all winners if you haven't read them. Why We Tithe - I felt led to share on this topic, and I'm happy with the way this post came together. If you are interested in why Jordan and I tithe, read this! He Saw Us - Whether or not you believe in a God who cares about us and watches over us, there is no denying the crazy events of what happened to when Jordan and I were in the Bahamas a few years ago. I don't believe there is any way you can call this a coincidence. Idols - The night after the most recent presidential election, I couldn't sleep and got up at 3:00 in the morning to write this. It is one of my most-shared posts. I Think I'm Okay - This post felt like a conclusion to what has been a really hard season for me; namely, going back to work full time and having R in daycare. Just Yesterday - As I think about R's second birthday coming up this summer, I really just want to repost what I wrote on her first birthday. I love this post. nothing quite like it at all - I stepped outside of my usual style and tried out writing a poem on Mother's Day last year. I love how it turned out. Thank you, thank you for reading and visiting this blog, for your encouragement, and for your comments and emails. I'd love to know a favorite post of mine if you have one that stands out for you personally! And if you have a request for a topic or a question you'd like me to answer, just let me know and I'll try to make it happen. Congrats on an exciting milestone! And I love that poem you wrote - too sweet! Congrats on 1 mil! That's is super exciting! Can't wait to check out some of your posts you have highlighted! Wow, 1 million! Woo hoo!! I love following along with you (especially since our kiddos are around the same age, and I feel like I can relate on so many levels), and I can't wait to check out a few of your older posts! Congrats on 1 million! :) I have read most of the posts that you highlighted but there were a few I had to go back and check out. I am LOLing at Grandpa's tie- that is so hilarious and random! CONGRATS!!! Hey that's a huge accomplishment no matter what!! Go you! I'm not sure when I started reading, but I'm glad that blogging brought us into each other's lives. You're still one of my favorites even if I struggle with reading regularly and commenting consistently. Congrats! I, too, hope my blog is a shining a light for Jesus, even in a small way. It was fun to look at your blog posts through the years! I haven't been around from the beginning, but I've probably read at least 90% of your posts since I found your blog four or five years ago. You have such a fun style of writing, and I love the honesty and humor in your words. Keep shining for Him! Everything about this is fantastic. I love your blog and I'm so happy I'm one of the lucky people to have found it! Your 5th paragraph really resonated with me- it's what I have always thought and felt about my own blog as well. super cool. I also loved the archive highlight reel! Eek 1 million!! That's amazing! I think you're so right in that everyone measures the success of their blogs differently. I used to get way more comments on my posts (like 25-35), and now I get more like 4-12, but you know what? I'm blogging the way I want, which doesn't interrupt my life, and when I just get one person who comments that the post resonated with them - it's worth it! :) You go girl! Happy to read along with you! Wow, congratulations! I would say that your blog is a success. Personally, I feel like I've learned a lot from you and been inspired by you. One of my favorite posts of yours is We Still Do. Now I have to go back and read some older posts that you wrote before I found your blog! Holy cow this is awesome! Great job! I still remember that post about your grandpa's tie - hilarious. Congrats!!! You've stuck with blogging for a long time and I think your blog ought to be a family treasure--so many stories, so much written down that otherwise might have been forgotten. I've noticed recently I'm getting closer to the 1 million mark on my blogger total pageviews...and yeah, that does sound pretty cool to me! congrats on 1 million! that's awesome. you hit the nail on the head, we all view success differently and want different things, so i just think it's important if you feel like you hit a certain spot or benchmark, you know? i don't particularly want to be a big blogger but i do like connecting with a small group of people, that feeling of community almost. i have absolutely pinned your green beans post but i have not actually cooked them yet. maybe one day lol. Hooray for 1 million! That's super awesome and I know it's a lot of hard work to blog so good job sticking with it.